Ulun Danu beratan Temple, a temple dedicated to the goddess of the lake is Ida Batari Dewi Ulun Danu on the edge of a huge crater. The dominant shrines are Meru’s (pagodas) dedicated to the lake goddess and the gods of Mount Batur and Mount Gunung Agung. The temple was built 17th century in worship of the main hindu trinity, brahma-vishnu-shiva, as well as the lake goddess dewi danu. Jatiluwih is a village that has vast rice paddies with beautiful views of terraced paddy fields landscape located in the Sub-District of Penebel, Tabanan Regency, Bali.If you are looking for the best place to see rice fields in Bali, then the Jatiluwih rice terraces could be on your list. 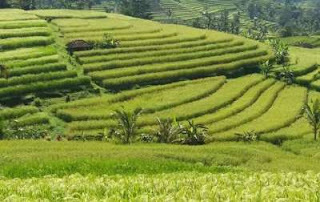 The Jatiluwih rice terrace is the most beautiful rice fields in Bali that we know so far.Jatiluwih village is famous as a tourist spot of terrace farming which is still using Balinese traditional irrigation system, Its location is close to The Mountain Batukaru with air condition fairly cool. 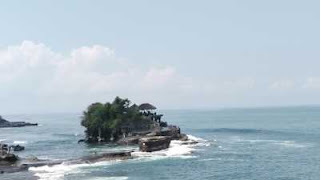 Tanah lot temple located in the village of braban, Kediri, tabanan regency.this temple located in the a huge black rock. This is the image of Balinese temples on the rock facing the wide open ocean, perched high above the crashing waves below, with as background the colorful sky at dusk, lit by the slowly disappearing setting sun.the temple buil. 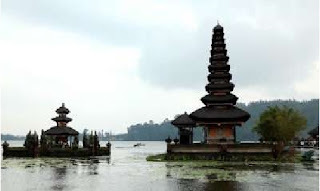 The temple was built in 16th century when dang hyang niratha made a long trip to the south part of bali island. Located in the sea some 300 meters from shore, the huge rock of Tanah Lot is reachable overland at low tide. On its northern side stand two Balinese temples built on an overhanging cliff which connects the islet to the shore. Underneath the rock are caves that are inhabited by sea snakes, believed to be the guardians of the temples.